Dog and cat food ingredients are determined based on the results of a quick online survey conducted on the Petbrosia website. When Petbrosia CEO Keith Johnson and his wife adopted their Jack Russell Terrier–Beagle mixes Mickey and Rosie in 2009, he never could have imagined the new four-legged additions to his family would end up inspiring him to develop what is likely the most healthful pet food on the market. Though Mickey and Rosie are brother and sister, Johnson realized shortly after bringing them home that his dogs have entirely different health and nutritional needs. While they were eating the same quality food, high-energy Rosie was thin, and Mickey started gaining weight. After trying a handful of foods and feeding rituals, attempting to monitor each dogs’ nutrition as closely as possible, Johnson and his wife found themselves frustrated. “The one-size fits all approach to pet food just wasn’t cutting it,” Johnson explains. That’s when it struck him — what if there was a pet food made up of the most nutritional ingredients out there, an all-natural formula that could be customized to suit the special needs of every individual dog or cat? With a background in pet nutrition and a veterinarian wife Johnson describes as “extremely involved” in their dogs’ eating habits, Johnson enlisted the help of specialists in pet food safety and animal science to create Petbrosia, the first and only pet food that takes into account the dog or cat’s breed, age and weight when creating the optimal formula and feeding instructions for an individual pet. Johnson says there are well-documented benefits to a pet’s health when they switch to a food that has been created to their specific needs. With no corn, no soy, no gluten, no wheat, no artificial dyes, and no icky by-products, the Petbrosia formula is packed with wholesome, nutritious ingredients, natural antioxidants, vitamins, probiotics, prebiotics, chelated minerals, omega-3 and omega-6 fatty acids. Petbrosia’s base protein is real, free-run antibiotic-free chicken, and Johnson says the company is ready to roll out its new lamb line for dogs and salmon line for cats this summer. “I wanted to make the best formula that me and my PhD nutritionist could design,” he adds. Sure the food is healthy, but dogs and cats across the country want to know something much more pressing: is Petbrosia tasty? “Picky dogs and cats love Petbrosia,” Johnson says laughing. “The people are going to pick Petbrosia because of the health benefits, but pets will pick it because of the taste,” he adds. Customers rejoice: the Petbrosia ordering process is simple. 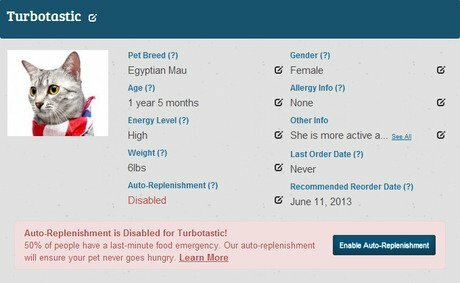 When customers first visit the Petbrosia site, they fill out a pet profile for their dog or cat, specifying the pet’s breed, size, energy level, gender, and any health concerns. Using a specialized algorithm, Petbrosia determines the most beneficial nutritional formula for that specific pet. But that’s not all — before Fido or Fluffy’s food is produced and packaged, a Petbrosia expert spends time looking over each pet profile to ensure all the pet’s needs are met. It is this individual attention that Johnson says sets Petbrosia apart from the rest. “We have eyes on your specific order,” adds Johnson. Pricing is simple — a 10 lb. package of Petbrosia is $39.99, and a 20 lb. package is $79.00. Johnson admits Petbrosia is perhaps more expensive than other pet food brands, but stresses that Petbrosia is a super premium product, and that the health benefits of such high-quality, custom-tailored food will pay off. “A day’s feeding is less than what people spend on coffee every day,” Johnson explains. Through their Rescue Bank, Petbrosia donates a percentage of each purchase to help homeless pets and the rescue groups that care for them. They have also partnered with Project Blue Collar to promote and celebrate shelter dogs. When asked about any future additions to Petbrosia products down the line, Johnson was excited to reveal pet treats are a definite probability, but it will take some development before the company releases Petbrosia treats. “It’s safe to say we won’t be doing just your standard dog biscuits,” Johnson says with a chuckle, explaining that the treats will come out once Petbrosia develops the most nutritious premium formula. Johnson says the company is planning to add more drop-downs to the pet profile menu, including more options for mixed-breed dogs, and they plan to add even more information about Petbrosia’s nutritious ingredients.